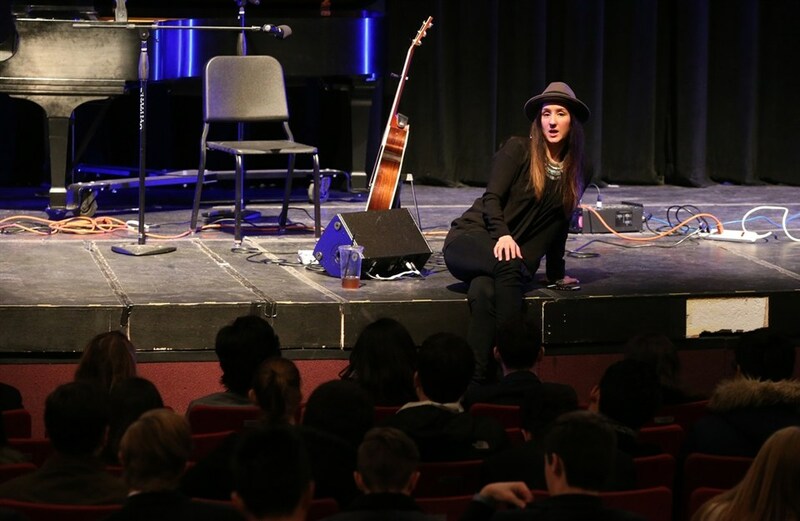 Singer/Songwriter Rebecca Correia is visiting Tabor this week as a Tomlinson Fellow Visiting Artist. The Joseph Tomlinson Fund for Visiting Artists provides the school community the rare opportunity to see world-renowned artists—and to learn about their work—without ever leaving campus. Correia, who grew up just a few miles away in Rochester, MA, has opened for a wide and varied number of artists, including Natasha Bedingfield, and Shawn Colvin. She has written over 200 songs, including So Long Goodbye, which she co-wrote with Keb’ Mo’, and was nominated for a Grammy for Best Americana Album. Correia now lives in Nashville, TN and spends upwards of 150 days on the road performing, so the Tabor community is very lucky to have her on campus! Her day started with a performance to the entire community during Chapel. She performed a wide range of songs, showing not only her impressive vocal abilities, but also her talents on the piano and guitar. The Madrigal Singers and Wind Ensemble took advantage of her time here, participating in a workshop in which Correia took time to answer questions listened to performances to offer helpful critiques and tips. Later in the day, many members of the Women’s Chamber Choir performed in front of her and listened to her many words of wisdom. Correia will be on campus again tomorrow, and will take part in a special “Soundings” program tomorrow evening. Student performers Julia Petersen, Julia Furneaux, Lucy Saltonstall and Emily Dineen will all perform sets tomorrow evening, and Correia will also take part with a set of her own. It promises to be a very special night!